When you book direct, you cut out the middle man (OTA’s like VRBO & Airbnb) and all the extra fees they are charging you! What Does it Mean to Book Direct? Finding a vacation rental has never been easier! A quick Google search will turn up hundreds of results, and Online Travel Agencies (OTAs) like Airbnb and Vrbo are usually at the top of the list. Most of the time, the same vacation rentals you find on these sites are also available through a property manager's website (like the one you're on right now). Booking Direct means you make your vacation rental reservation through the property manager's website instead of on an OTA. When you reserve one of our vacation rental properties on other websites like an OTA, you'll often pay extra fees and charges. 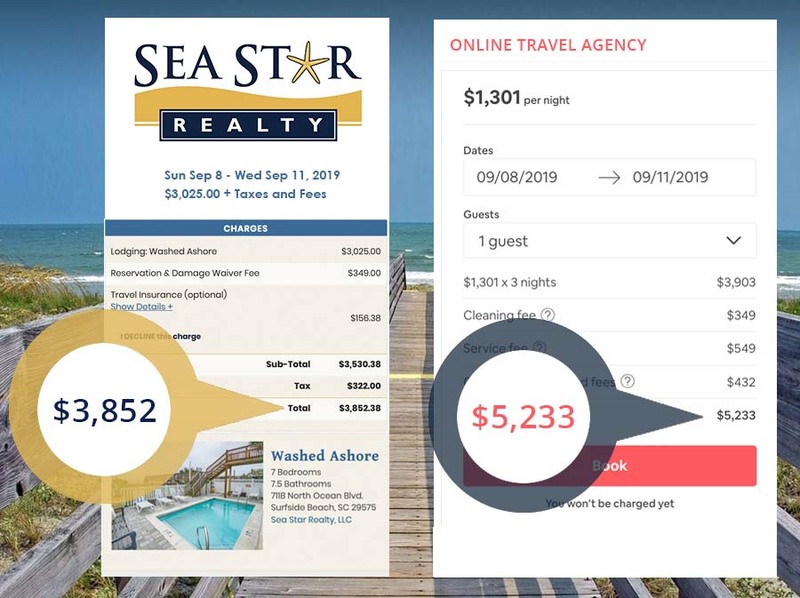 When you book directly through Sea Star Realty you can save on these fees, which means more money in your pocket for your Myrtle Beach vacation! You read that right - most properties booked directly through Sea Star Realty come with $250 worth of FREE beach gear! Simply make your reservation on our website, and watch out for an email with your free beach gear credit. You'll be able to pick from a variety of items, including barbeque grills, kayaks, bikes, beach loungers, umbrellas, carts, paddleboards and more. We're family owned and operated, and our realtors and reservationists are area experts. We can provide the best local recommendations for activities, dining and general Grand Strand enjoyment. Our approach to personalization and customer service is something you just won't find when booking through other sites. We offer travel insurance, concierge services and a smile with every reservation. Don't wait any longer to save big bucks and get free beach gear - make your vacation rental reservation with Sea Star Realty today. We offer vacation rentals with private pools and pet-friendly homes. Looking for more savings? Check out our current specials.